Stickman Hook is an amazing arcade game from Madbox. Tap to hook and make incredible jumps. Press your screen to hook your stickman with your grapnel and release to let go. Avoid every obstacle that stands in your way. Execute all these acrobatic tricks in a row like a boss. 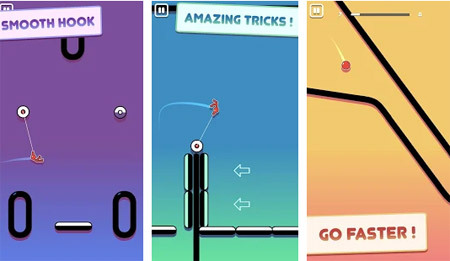 Embody the spider stickman and finish all the levels with the same agility as a spider. Swing from hook to hook to pass all the levels. The faster you go, the more amazing your tricks will be. You can swing like a spider, your stickman dances at the end of each game. There is a grappling hook in the game. If you get stuck in the game, check out the video walkthrough and gameplay for the game. This entry was posted in Android Games, iOS Games, Mobile Games, Walkthrough and tagged Stickman Hook Cheats, Stickman Hook Game, Stickman Hook Gameplay, Stickman Hook Guide, Stickman Hook Hints, Stickman Hook Review, Stickman Hook Solutions, Stickman Hook Strategy, Stickman Hook Tips, Stickman Hook Walkthrough by Marvin. Bookmark the permalink.